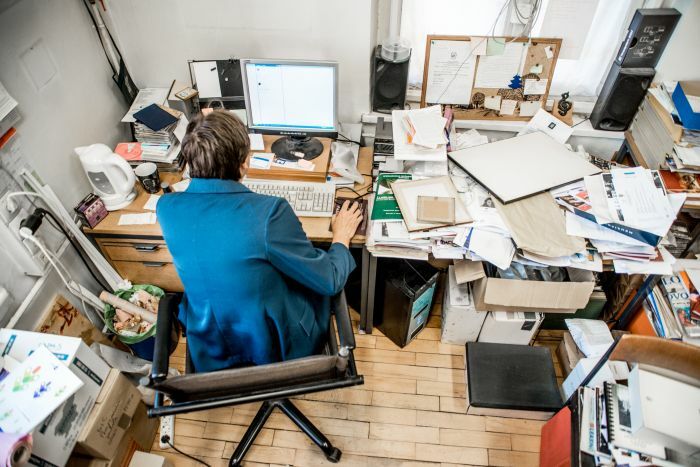 Despite ever more powerful planning and organizing software, physical clutter remains a problem for many. Aside from being where we put computers, desks can also fill in as a catch-all for papers, folders, stationery, and other miscellaneous items. And over time, that catch-all can become messy, disorganized, and overall an eyesore. To help you prevent that, we take a look at several sometimes overlooked organizational help that will help you keep the clutter to a minimum. Tool: Classification / File Folders – One of the first things you need to get a handle on is the massive stack of unsorted papers on your desk. Whether you put them in a hanging file folder for use in a desk or filing cabinet, or a standard classification folder, it needs to be done. Tool: Binder Clips – Good for more than just keeping your chips and other snacks fresh, they also come in handy for keeping those stacks of paperwork together. In addition, if you are having issues with cable/cord clutter, you can use binder clips to keep them bundled together neatly. Tool: Letter Trays – Far from being anachronisms in the age of e-mail, letter trays provide a place where you can file important printouts and reminders. And barring those uses, they still make for an excellent file folder storage bay. We suggest getting a letter tray that supports at least two slots, such as this OIC side loading tray. If you want to flaunt style however, you can always go with this finished bamboo letter tray. Tool: Desktop Paper Sorters – If your mess requires more storage space and filing than a letter tray can provide—after all, you shouldn’t be stacking them ten high—what you may need is a paper sorter, such as this Rolodex five-section tray. Tool: Pen & Pencil Holders – The other part of keeping your workspace neat is to not have pens and pencils scattered everywhere. In fact, just a simple metal mesh cup-style pencil holder can hold other items as well, including rulers, paper clips and more. For the crate and barrel crowd, wood once again comes to the rescue with this fancy Eldon wooden pencil cup. Or for the more minimalist among us, an old coffee cup will do just fine. Tool: Storage Box – A storage bin serves as an excellent catch-all for paperwork and everything else a little too bulky to store. Granted, it doesn’t always help organization, but it does move the mess out of the way. Just be sure to put the bin under your desk and not on it. You can opt for an open-top storage box designed specifically for files and folders or your run-of-the-mill plastic storage box with a lid. Decide which items are most used and which are least. Put the most used items in easy reach but not just anywhere on your desk. In fact, rarely used items should never be on your desk. When sorting paperwork, group and label them instead of just putting them all in folders. This way, you won’t need to spend time later trying to track down one form or letter. Regularly organize your desk based on a schedule, not just when you feel the mess creeping onto it. Have a trash can handy and don’t be afraid to use it. If it isn’t going in the trash can, it may just be staying on your desk. With the application of a few products and the organization tips above, you can turn that eyesore of a desk into something that you can actually accomplish work on. Going forward, be sure to avoid getting into a situation where you need to do so much Spring cleaning. Spring cleaning for your desk should be year round, as a messy workplace and decrease productivity. We discuss strategies for eliminating that clutter. That first photo looks very similar to the state of my office space. Looks like I have a lot of work to do!